Blog Emerging 4G networks are proving to be more reliable and deliver a better wireless experience than established 3G networks, a J.D. Power and Associates study has found. 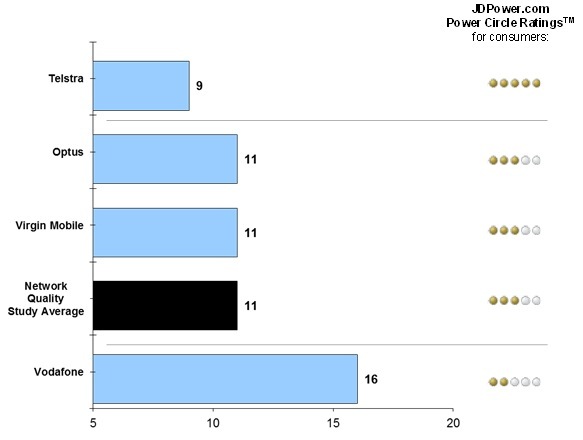 The 2013 Australia Wireless Network Quality Study measured problems per 100 (PP100) based on ten common problems that impact overall network performance, including dropped calls, calls not connected, audio issues, failed or lost voicemails, and more. While few will be surprised that Telstra’s network came up tops in the survey, more encouraging for the industry as a whole was a strong reduction in overall problem levels during 2012, with an average of 7 PP100 this year compared with 11 PP100 overall in last year’s survey. Data transfers were easier on 4G networks (17 PP100) than 3G networks (21 PP100), as were mobile Web-browsing slowdowns (16 PP100 vs 20 PP100); little wonder that 3G customers were far less likely to switch carriers within the next 12 months. It’s very interesting to see the stark performance differences between the newest generation of network technology, 4G, and other network services that were the first offerings of high-speed data centric devices baed on 3G marketed devices in 2011. With the network advantages of using 4G technology, in terms of spectrum efficiencies and increases in data connection speeds and reliability, it’s not unexpected that wireless carriers are rushing to expand and upgrade their networks to align with this latest generation of service. The full survey is available here for your reading pleasure, and may elicit some head-shaking from those who are seeing much different results from their own mobile wireless services. How has your 4G performance been going, particularly with relation to your 3G experience? Surprise surprise… there are fewer users on 4G than 3G. This really doesn’t need research to prove this point… any wireless network uses shared capacity in each cell, and if there are fewer users, performance will be better. Telstra Next G was phenomenal when it was priced as a “first class” product by Sol Trujillo. When it was democratised with more competitive pricing after the American management team shipped out, a couple of million users flooded in, and performance is now (while still comparitively good to other networks) more “economy class”. Sydney has come to the same conclusion any reasonable person would – 4g has hardly any contention yet. Wait until everyone on 3g has to renew their contracts and opts for a phone upgrade on to 4g – by the end of next year you will have similar reliability and performance issues that 3g faces today. The only way around this is to increase tower density, and there aren’t just cost and regulatory barriers to this but tremendous community hostility. Nothing to see here but a study that found evidence to come to the conclusion it devised before it even got started. Why is Virgin Mobile listed separately from Optus? Aren’t they owned by Optus, and use the Optus network? Yes, they are owned by Optus and use their network. It amazes me anyone pays any attention to the jokers at J D Power. Wow…what a shock. Vodafone has nearly double the problems of everyone else….and people still wonder at Vodafone why they’re losing customers….